Learn how to reduce your accent with one sound in episode 3 of the Power Learning Podcast! Episode 3 introduces the winners of our Master English Conversation Scholarship Contest and gives the first tip for everyone about how to improve the “flow” of your English so you can sound more native. 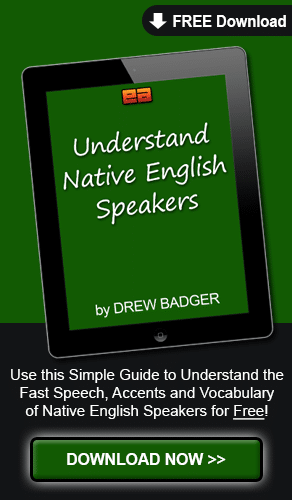 If you want to learn how to reduce your accent by practicing just one sound so you sound more like a native English speaker, this episode is for you! Hello, and welcome to the third episode of the englishanyone.com Power Learning Podcast. I’m really happy to be making this episode today because I know, uh, we still are working on things with the new website, and there’s always new things to learn and new challenges. And I hate not being able to put new videos up on the website, so I’m happy to make this podcast, uh, and at least we can have this up on YouTube while we’re still working on things on the website. But everything is going really well. All of our members are back in the premium section of englishanyone.com with their Master English Conversation lessons. And with this first podcast after we just, uh, chose the winners for the Master English Conversation Scholarship Competition, a fantastic contest where we had a whole bunch of students from all over the world, I’ve selected four students that are going to be studying with me personally. And they will get tips from me every month, and they’ll be able to send me mails and talk with me about things, about the successes they’re having, and the challenges they’re having. And every month I will produce a new Power Learning Podcast episode that I can give tips to them, but that I can also share with everyone else that’s learning out there. Initially, I created or I kind of designed the scholarship for just one student, but I really wanted to give a good idea for everyone learning out there about what it’s like, the different challenges that people have, depending on if you’re a man or a woman, if you’re very young or not so young, or whatever the different kind of challenges you have, depending on where you live in the world. So I ended up choosing four great students, uh, that are all from different parts of the world, different ages, uh, and it should be a really interesting experience for everyone over this next year. So you can see what people, no matter where they’re coming from, there are certain principles about language learning, and we’ll be going over those. But if you follow those principles, if you follow these certain things about how to learn a language, you’ll really be able to find success quickly. Because there are so many bad things you can do about learning, and so many things that waste your time, so I really want to give a lot of great tips, and you’ll be able to, uh, feel motivated and inspired by the people that are on this competition. So really it’s a…it’s a chance for everyone to improve, but especially, uh, all of these free Master English Conversation lessons that these four great, lucky winners have received. They’re going to get into Master English Conversation, we’ve got over a year of lessons for them to practice with, so even though they will only have to complete one special mission homework assignment for each month, they’ll be able to use all of the previous ones and go back. And we’ve got hundreds, probably thousands, now, uh, words, phrases, grammar points, lots of different things that they can practice, so hopefully it’s not too much information. But I’m excited to have them get into the program, and then be able to tell everyone else what it’s like to learn with Master English Conversation. So in this episode of the Power Learning Podcast, it won’t be too long, but first, I’m going to have each of our four winners from the Master English Conversation Scholarship Contest introduce them self, tell you their name, tell you their age, tell you a little bit about them self, uh, and then also a message a little bit for you, so you can feel inspired to get out and keep practicing yourself. Remember, all four of these people are not living in an English speaking country. So we’ve got one from Vietnam, one from the Czech Republic, we’ve got India, and then we’ve got El Salvador. I love to say that, I love that…that Spanish pronunciation. El Salvador. I love that. Anyway. So we’ve got students…nobody is living in the United States, or Canada, or England, or, uh, any other country that would have, uh, English as a kind of regularly spoken language. Even if a lot of them may be studying it in school. So I want you to see that you don’t need to live in an English speaking country in order to practice. They will be learning all of the secrets that we teach in Master English Conversation, and then you will also be able to get to learn, uh, a lot of fantastic things about how to improve and ways to go out and meet more people so you can really be practicing with native speakers. So I’ll let them introduce themselves first, and then I will come back after that and I will tell you and the four winners what they’re going to be practicing this month. So, enjoy. Yen:	Hello, my name is Yen. I’m 17 years old. I have been [study ?] English for six years, but it seems that my master that learn me English didn’t bring good results. So this time, with englishanyone.com, I hope I can become a fluent English speaker. Bhaskar:	Hi there. I’m Bhaskar. I’m from India. I’m an employee, and working in an outsourcing company. I’m 31 now. English is one of my subjects in high school and in college, and I studied this as a subject, and speaking never included in my English study. Actually, my [sincere ?] English practice has been going on for one year. When I completed my studies, my conversational skills are almost zero. Once I started my career, I realized the importance of fluency in English to improve my career opportunities. But for some reason, even though I understood the importance of English, I didn’t take any step to improve my English. And a couple of years slipped away without doing anything to improve my English skills. Oh, but…I think in March, 2012, one fine morning, I took a decision to improve my English. And since that time, with the help of internet, I started my English practice, and now I came to this level. While my practice is going on, one day Drew and also the scholarship contest, I participated in it, and after completion of two rounds, Drew selected me as one of four winners. When I received a mail from Drew about this news, I felt very happy, and, uh, I can’t say how much I was happy at that time. And I envisioned how my English would be in 2014, and in that vision what I see is I am talking, I am speaking English as my native language. And my writing skills are also like my mother tongue. Yes, this is what I’m going to achieve by the end of this course. There is no doubt about it. With the guidance of Drew, and with the help of his awesome lessons, my dream will come true. You guys are all going to see this fact. And more importantly, I never forget Drew’s help in my life, and his wonderful support. Thank you. Jaroslava:	Hello. My name is Jaroslava [Inaudible 00:07:57]. I am from Czech Republic. I am woman. I am 42 years old. I was studying English for six years when I had been going to school before 27 years. I studied, um, only from books. English was very boring lesson in school. I didn’t good student at English. I didn’t do English 20 years. I again was studying English before one year. When I will be English fluently, I give hope other people, older 40. I give hope other women that is possible study English and working, and caring about children, and husband, and household. You could be English fluently too, and change yours life. Carlos:	Hi, everyone. My name is Carlos. I’m 25 year old. I been learning English for two years and a half. I want to say to you something about learning English. I know that it’s very difficult. It’s very tough. And I know that you know that as well. And for that reason, I want to invite you to follow us in this great journey. Because we will be fluent, and you will see that. You will see that. I invite you to keep on learning, because it’s very important. Is for your life. Is one of the most important things that you’re going to learn in your life. So don’t…don’t be panic. This is going to be amazing. Even if you don’t speak, uh, very well. Uh, I don’t speak very well as well, and I know that that is not the reason how can I get fluent. The reason is I don’t have confidence, and that’s why I’m not fluent yet. But I want to be. I want to be fluent. And I encourage you to go on learning. This is going to be great. And I invite you to join us and follow us, and you will see that this is possible. Okay. See you around. Bye-bye. All right, I’m back again, I hope you enjoyed listening to our lovely four winners. They’re really great people. I really enjoyed, uh, listening to their entries. So each of them, all of the people that, uh, that applied for the scholarship competition had to send in audio recordings of themselves, and every month they will continue to send audio recordings so you can really look at the progress they’re making. So we can kind of call this a benchmark. A benchmark is a kind of base level where you begin to check the progress of something. So each month this is also for themselves, but for you listening out there, where you get to check and see how they’re pronunciation is improving, or how their vocabulary is…is building, or their confidence is building as well. And they can even check back, uh, in a year from now, they can go back and listen to this and see, wow, just…just how different their English is, just by doing a little bit of practice each day, and being smart about how they practice. So this month, what I really want the four winners, but also you out there, everyone else that’s listening to this, I’m going to…We kind of go into fluency, even though you already understand most of what I’m saying right now. But when we talk about how to get fluent in a language, I really want to focus on one specific thing each month. A different part of fluency. And that way you don’t have to go out and worry about so many different things at the same time, because it can be confusing. There’s so many tips online, so many videos, so many different teachers and other students that will tell you lots of different information, what you should be studying, how you should be studying, many different things like that. But in the same way, when I was a young baseball player, I used to play in Little League. This is just a, uh, kind of a level for young children that are playing baseball. But I would watch a lot of the parents, and they would always have something to say to their kid. Don’t do that, or do this, or watch the ball, or do these other things. And the kids, they would do the best they can, but the mind, the human brain, it can’t hold all of that information at one time. So I don’t want to give a thousand different tips about what you could do. Uh, they will have access to all of that information by using the lessons in Master English Conversation. But for the four winners, and as well for you and everyone else that’s listening out there, teachers and students, I really want you to focus on this one specific thing this month. We’re going to go into fluency starting with the biggest possible thing, and then getting more specific as we go through the year. 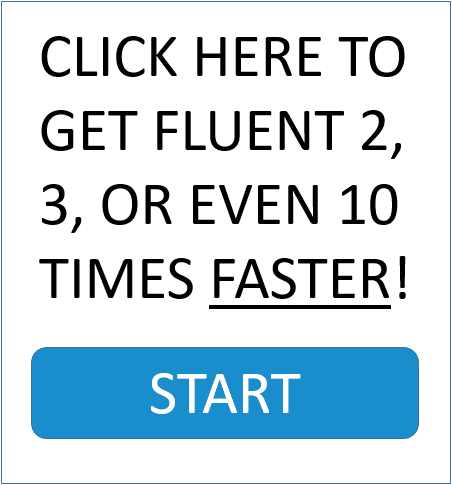 So this first tip is all about the kind of sound and speed and flow of the language. And really this is just…even listening to my voice right now, it has a certain melody to it. It has a certain beat. A certain flow to it. And each language has that. And you can usually tell a different language. Even if you don’t know exactly what the language is, you have a general idea of what the language is just by the melody of the language. So let’s say, uh, an example from Vietnamese. I don’t speak any Vietnamese at all, but the sound of Vietnamese is so different from English, and the flow and the beat, and it’s more of a blah, blah, blah, blah, blah, blah. And I’m…I’m doing that really badly because I don’t speak Vietnamese, but what I want you to think about is how the sound of Vietnamese, or Indian, or Thai, or whatever your language is, is different from English. And the way you can practice that is the same way I’m speaking right now, in the same speed, I just take one sound, like blah. Blah, blah, blah, blah. And I can introduce myself. Blah, blah, blah, blah. Blah, blah, blah, blah. Again, I’m not saying any specific words, because all I want to do is just get the flow of the sentence. So whatever sound you can make, make that sound perfectly. Don’t…don’t try to pick a sound that’s difficult for you to make, but pick a sound that’s easy for you to make, and then listen to any kind of English you hear in your day, or, uh, a video, or something you see on the news, or a radio show, anything like that. Whatever you can find, I want you to repeat that same thing back. Even if you don’t know all of the words, or what all of them mean, I just want you to repeat back using blah, blah, blah, blah, blah, blah. Just one sound. It could be dee, dee, dee, dee, dee, dee, or muh, muh, muh, muh, muh, muh. Whatever the sound is, whatever you can make, a sound from your own language. So that way it will be much easier to practice. Find some natural, native English, even if it’s fast, and just listen to the flow, and then try to copy that. So you could find a YouTube video, or watch a DVD, and pick maybe even just 10 seconds, or 20 seconds, if you want to challenge yourself, you can go longer. But what you’re really trying to do is get the flow of the language. The sound of how the words blend together. The sound and the way that a person makes a sentence. So when they’re angry in English, they make a different kind of sound. I remember when I was younger I used to watch, uh, an old TV show in America called “I Love Lucy”. And the husband of Lucille Ball in the TV show, his name is Desi Arnaz, uh, and he was from Cuba, and he had a very specific way of speaking. And he would say “Lucy, you’ve got some ‘splaining to do”, and it was much different than English. I…I can’t really do it perfectly right now, but you can hear that it’s different from English. Or even Japanese. If I say…Let’s say I want to say something in Japanese, like, uh, I want to see a movie. [Inaudible 00:17:17]. And it’s a different way of speaking. [Inaudible 00:17:22]. And even though it’s not perfectly…it’s not perfect Japanese, it’s definitely different than what I’m saying in English. I want to see a movie. I want to see a movie. I want to see a movie. Blah, blah, blah, blah, blah, blah, blah. Blah, blah, blah, blah, blah, blah, blah. It’s different, it depends on the actual language you’re doing, but really find something where you can get the…the tone of the language, the speed of the language, and don’t worry about the actual words or the vocabulary so much. I really want this month for the four winners, and also for everyone studying out there, I really want you to sit back and just practice those sounds. If you can do that, then you will become much better at hearing when people are making particular kind of sounds, uh, or if they mean a certain thing, by listening to the flow of the language. So this month, we’re starting with probably the biggest thing you can start with in…in overall fluency, at the kind of intermediate to beginning of advanced level, which is understanding the overall flow. When you listen, if you go back and listen again to the four winners when they’re introducing themselves, then you’ll…you’ll really get a good sense of how, even my name is…Even just saying that, they have a specific way of doing that that’s particular to their language. So just like, uh, if I’m living in America, and I meet someone from India, I usually expect them to have a certain kind of accent. And the reason people have an accent is because they don’t really try to practice the real way that people pronounce things. They get the…the words correctly, but they’re not speaking in the same way with the same flow. So if it’s your goal to actually speak like a native speaker, and you want people to think, wow, I’m actually talking with a native speaker, not just someone who understands the language or knows the vocabulary, but they really understand what it’s like to speak. If you want to be that, if you want to have that, and people will be really impressed by how you’re able to speak, then practice your flow. Have an excellent day, and I will see you next time. Bye bye.